Two kayakers at Jade Bay on Cultus Lake in Chilliwack, British Columbia, Canada. 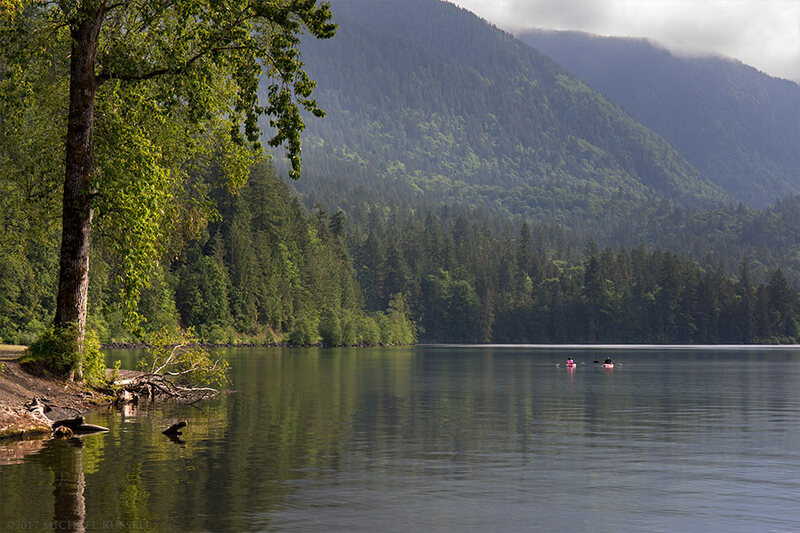 Photographed from the Jade Bay Boat Launch at Cultus Lake Provincial Park. Jade Bay is one of a number of boat launches on Cultus Lake in Chilliwack, British Columbia’s Cultus Lake Provincial Park. I’ve often stopped here in the fall as it is one of the areas you can get a good view of the lake from the east side. There is no visitor parking here, however, as the parking lot is strictly for vehicles with boat trailers. Nevertheless I made a brief stop in the spring to take a look at the lake as I was passing through Chilliwack, and made this photograph of Jade Bay and two people in kayaks paddling nearby. The mist around the mountains (which I believe are Teapot Hill, Black Mountain and Tsar Mountain) in the background looked like they might yield some interesting photos, though I was hoping they wouldn’t intrude on my plans to photograph other mountains later in the day. I am sure at this time of year the parking lot is chock full of boat trailers, but on this afternoon there were none – literally zero cars/trucks/trailers in the lot. So I parked (at the opposite end) to make a quick walk down to the water. When I was making this photograph someone (not a park employee) pulled into the lot and drove over to where I was in order to chastise me for not having a boat trailer. I found this a bit amusing considering how empty the place was, though I presume that this is a big problem when the parking lot is packed. The spot feels like a perfect day use area, and I’m sure people try to use it as such during the summer when the park can be rather full. Pointing this out when the area is deserted and there are no other vehicles or boats in the area seems a bit strange, even if there are problems in the summer. If I had this encounter to do over again I might point out that the person scolding me didn’t have a boat trailer either, but my usual idea at the time is to get uncomfortable conversations over as quickly as possible. This one was over in 30 seconds. Photographers who come over and want to talk about gear honestly tend to make me more uncomfortable than the self deputized boat trailer sheriff did. For more photographs of BC’s Provincial Parks visit my British Columbia Provincial Parks Collection of galleries. 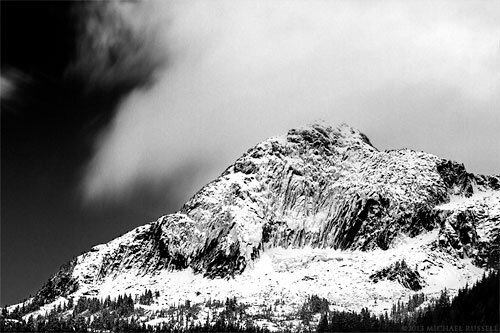 I am pleased to have two of my photos in the new book The North Cascades: Finding Beauty and Renewal in the Wild Nearby by William Dietrich. 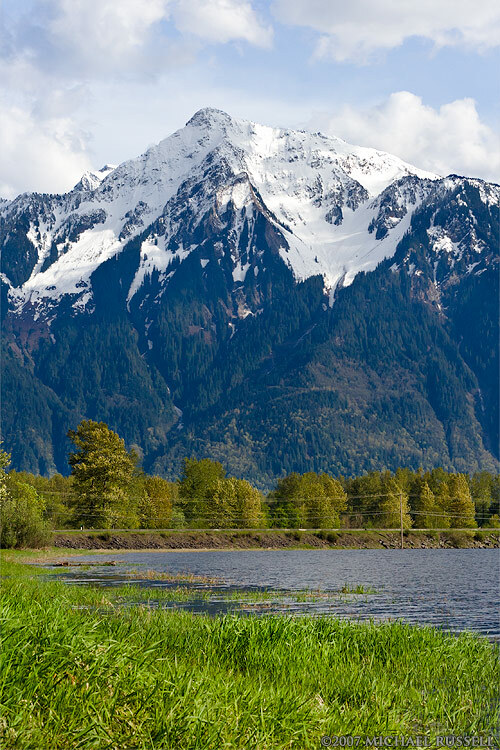 The photograph of the Eastern Cottontail and Mount Pierce in Chilliwack, British Columbia (below) both made it into the book. I haven’t read the book yet, but I was pleased to see one thing when I looked through it (beyond the great photography). The map of the North Cascades did not stop at the US/Canadian border as I often see it shown – but continued on up into British Columbia where the real northern bounds of the North Cascade Range lies. For more information about The North Cascades: Finding Beauty and Renewal in the Wild Nearby – visit the website http://www.wildnearby.org/. I mostly make my photographs in colour. I think that is just the way I am better able to see most landscape scenes. I am trying to see a bit better in black and white, and recognize which scenes and light may be appropriate for that type of conversion. Sometimes colour just isn’t the best option. During my trip to Chilliwack Lake Provincial Park back in October, I made this photograph of Mount Webb with black and white conversion in mind. The sun, if it showed up, was going to set behind this mountain, and from this angle I was not going to see any sort of nice alpenglow or sunset light anyway. I was early for any potential sunset display, so I photographed this mountain when I arrived as the light I had at that point was appropriate for my intentions. The reason I decided this scene would be better in black and white was due to the light at the time, and the textures on the mountain. I still tried to process it in colour, but the results were not satisfying. I like the textures in this photograph from the rocks and the fresh snow, and even the small glacier at the bottom of the rock face that I had never noticed before on previous trips to Chilliwack Lake. The textures just didn’t show themselves in colour as well as they did with black and white. You can view other photos from the same day in my image library: Chilliwack Lake Provincial Park. On the way home from my photography trip through the Okanagan Valley and Manning Park in British Columbia I passed through the Hope area into Chilliwack. I avoided stopping in some of my favourite places near Hope as this was a Friday evening just before a long weekend. Traffic was very busy near anything resembling a campground or recreational area. In face, there was a pretty good stream of cars from Langley through to Princeton if not beyond! From the highway just outside of Chilliwack I looked up towards Mount Cheam and saw this lower part of the peak still visible through the clouds. I took the next exit, a few back roads and lined up this photo. 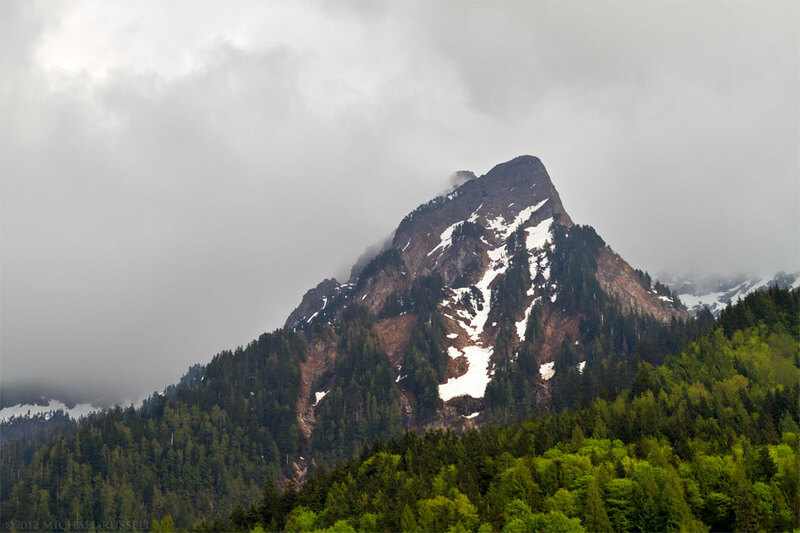 This is not all there is to Mount Cheam – the mountain itself is much larger, but I liked this small part that was poking through the clouds. Way back in 2007 I purchased my first DSLR – a Canon 30D. I only had the 50mm Canon lens with it (f/1.4) and was forcing myself to use that lens to its full potential before I bought something else. This meant a lot of “zooming with my feet” and compositions that were slightly constrained. Though this was largely due to budget concerns, I do think this helped me choose my next lenses wisely. I always waited at least 6 months between lenses to make sure I knew what I “needed” next. I have not regretted any of my lens choices so far. I made this photograph in 2007 with the 30D and it remains one of my better photos of Mount Cheam. This location is on Seabird Island just outside of Aggasiz, British Columbia, Canada. I have returned to this location many times, but still cannot seem to find a time where that slough is full of water. A big muddy expanse just isn’t as photogenic! 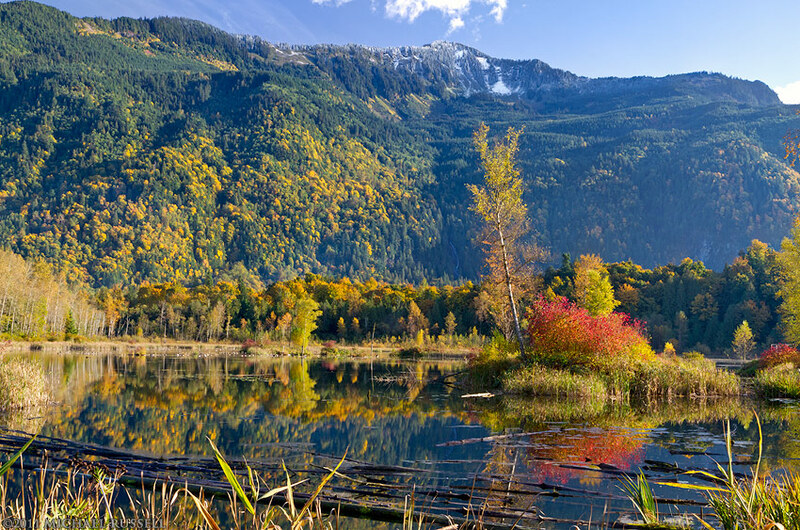 Cheam Lake Wetlands Regional Park is one spot in the Fraser Valley where I always go looking for fall colour. 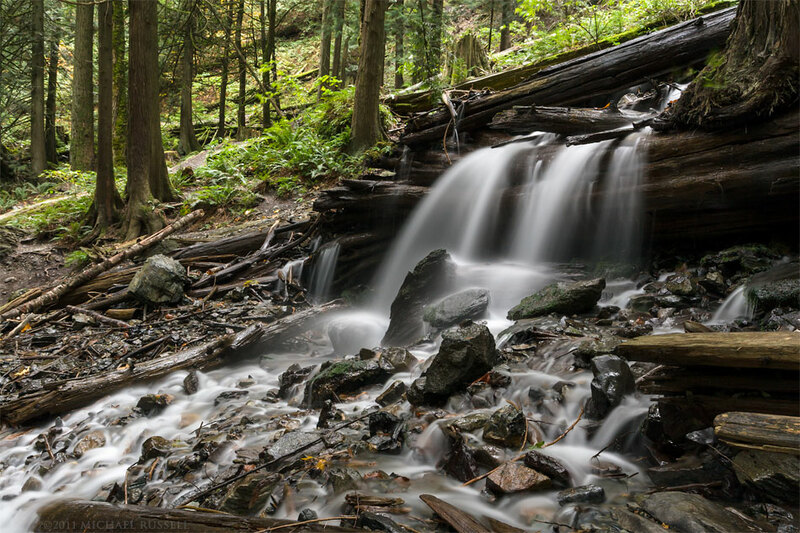 An old limestone mine, the park was created in 1990 and now is a great place to photograph not only fall colours, but wildlife – especially birds. Always a bit out of my telephoto range though. I visited Cheam Lake twice this fall. Someday I need to explore it further – it is close to so many other locations I like to shoot at that I tend to not have enough time. The first time I was there this year I did not find a lot of color but I did manage to make this photo of a Rabbit. I realize this may not be the most exciting or exotic species, but I’ve always like rabbits. 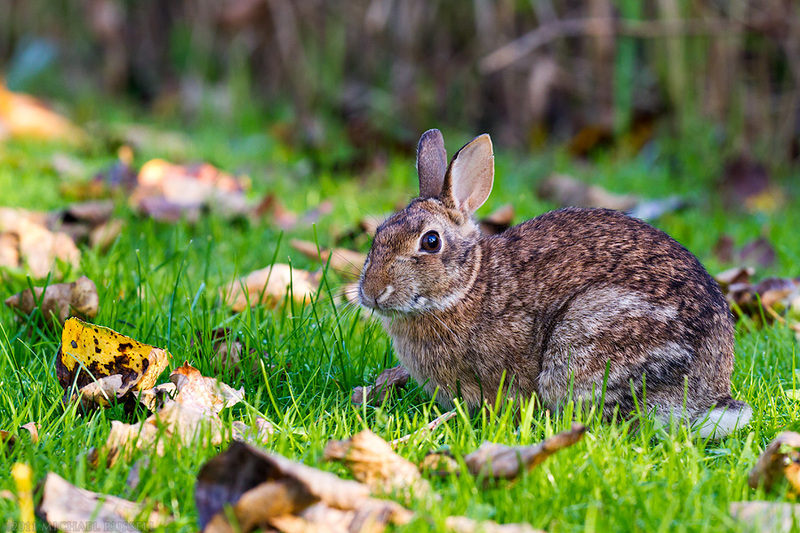 This Eastern Cottontail (Sylvilagus floridanus – an introduced species here in British Columbia) allowed me to briefly make some photographs of it. A few more mouthfuls of grass and it took off into the deeper underbrush near the lake. Considering the amount of these I have in my backyard, I am surprised my first photo of one was taken over an hour away from home. Fall color at Bridal Veil Falls in Bridal Veil Falls Provincial Park, Chilliwack, BC. I have always liked Bridal Veil Falls Provincial Park. My parents used to take me there when I was a kid sometimes when we would venture this far out into the Fraser Valley. I remember the hike to the falls being the longest most arduous journey ever. Now it takes me about 6 minutes – though the sign says be prepared for a 15 minute hike. I don’t know who those people are, but I guess if you had to take it slow it could take that long. On this particular day I was heading out to Hope, BC and planning on driving back through Harrison Mills on Highway 7. I stopped at the falls because the overcast sky was much better for photographing here than the direct sunlight I am used to finding in this location. 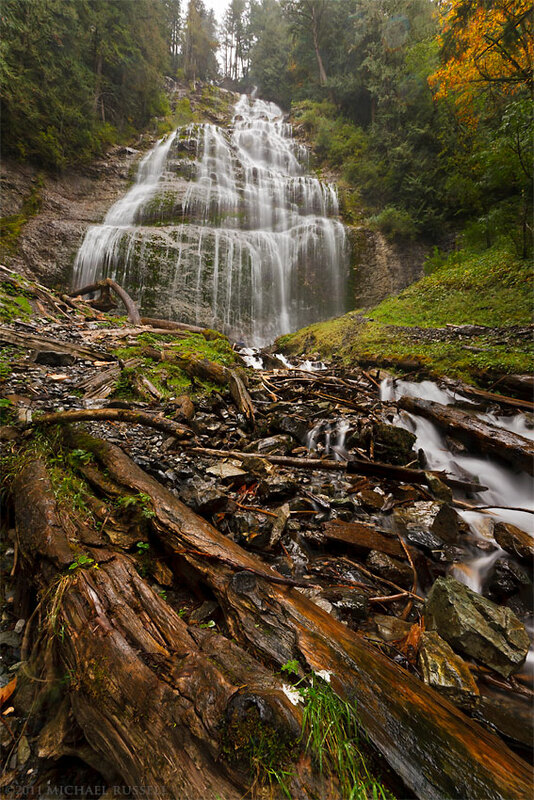 So I setup and shot a few of the lower falls, very minor, waterfalls along Bridal Creek before heading up to the main Bridal Veil Falls waterfall. As soon as I arrived the skies opened up with a solid rain so this shot here is one of the few that did not succumb to the pitfalls of shooting in the rain and the spray from the falls themselves. You can not see them in this shot but there are a few teenagers further up just beside the falls who, being somewhat drunken from the looks of things, decided that it would be a good idea to start rolling small boulders down the hill towards the viewing platform and another photographer who was shooting from there. Dodging rocks is usually when I decide to call it a day so I will be back next fall, hopefully with a bit better fall colour and nicer weather – and fewer rocks! More photographs from this location can be found in my Bridal Falls Provincial Park Gallery.